This website is dedicated to the men of the 28th Infantry Division, 110th Infantry Regiment that bravely fought their way across Europe from August - December 1944, ultimately sacrificing themselves to help buy the precious time needed for the 101st Airborne to arrive at and defend the critical crossroads town of Bastogne, Belgium on 18 December 2016. I just found out that I was honored with a second book award today. Check it out at www.BestBookAwards.com. I am humbled! Heroes of Hosingen is now available for sale in the Pennsylvania Military Museum Store in Indiantown Gap, home of the Pennsylvania National Guard, the oldest national guard unit in the United States, which was formed during the Revolutionary War against England in 1747 when Benjamin Franklin organized his battalion of “Associators” in Philadelphia. 15 June 2016: Kirkus Reviews is promoting their Heroes of Hosingen review within the Indie category in their bi-monthly publication. The Heroes of Hosingen is the epic story of what happened in the last frontline town to fall in the early days of the Battle of the Bulge; the garrison at Hosingen, Luxembourg. It was here that 300 men would make a historic stand against an army of up to 5,000 of Hitler’s elite Germans soldiers, supported by twenty superior German tanks and artillery. K Company, under the command of Capt. Frederick Feiker, Capt. William Jarrett and 125 men from Company B, 103rd Engineers Battalion, the 2nd and 3rd platoons of M Company (heavy weapons company for the battalion), 2nd platoon of 630th Anti-tank Company, twenty men from a “Raider” unit and five tanks from A Company, 707th Tank Battalion, worked together to make it as difficult as possible for the German army to move its men and equipment past the village on their way to Bastogne. These brave men carried out their “Hold at all cost” orders” until they had exhausted all their resources. Finally, surrounded, abandoned by the division’s other units that were allowed to fall back, and out of ammunition, food and water, Captains Feiker and Jarrett waved the white flag and surrendered their units to the Nazis mid-day on December 18, 1944. Unlike most of the books that tell the tale of Hosingen’s heroic stand, this story doesn’t end with their capture. 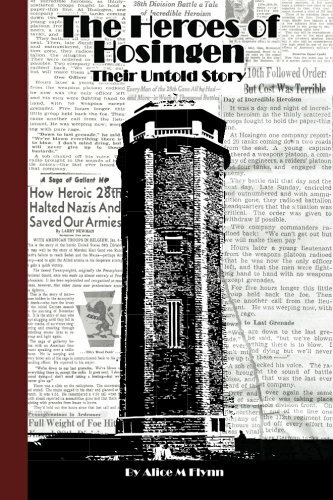 It is only by hearing the unimaginable tales of eight soldiers’ imprisonment that one can even begin to comprehend what the ultimate consequences of the “Hold at all cost” order truly meant for the men in Hosingen and the thousands of other American soldiers from the 110th who suffered the same consequence. This title participates in the Kindle MatchBook program, which allows customers who have purchased the paperback book to purchase the Kindle ebook for $0.99. This title also participates in the Kindle Book Lending Program. The Kindle app is available for most major smartphones, tablets and computers. That means, download the free Kindle reading app and you can buy a Kindle book once, and read it on any device with the Kindle app installed*. You can also read that same Kindle book on a Kindle device if you own one. *For iPhone and iPod, and iPad users: Purchase Kindle eBooks at Amazon.com from any web browser and choose to have your eBook delivered to your app.